It often seems like there is no time to prepare healthy food. Wouldn’t it be great if you could have great tasting healthy food in 5 minutes? In this article, I’ll share my riced cauliflower fast food meal. This dish is guaranteed to fill you up for hours! I am not a chef. In fact, I am horrible in the kitchen. While my wife is a fabulous cook, I’m not. If your time and cooking skills are limited, like me, you may want to consider giving this recipe a try. We love Trader Joe’s. For those of you outside of the US, Trader Joe’s is a popular and affordably priced health food store. We have one between our home and my hospital. While these four ingredients all came from Trader Joe’s, you could easily improvise with your local health food store. While you could buy fresh riced cauliflower, I like the frozen variety better. It is always fresh and I never have to worry about it going bad. Given that it was frozen immediately, you don’t get the loss of nutrients that often comes from long farm to plate transport times. I use the whole bag for this riced cauliflower fast food meal. I love the frozen melodious blend from Trader Joe’s. There are only six ingredients with no chemicals, preservatives, or any added sugars. The six ingredients are cooked green lentils, cooked red lentils, cooked green garbanzo beans, tomatoes, extra virgin olive oil, and sea salt. This little-frozen concoction is a meal unto itself. I just use half the bag for this riced cauliflower fast food dish. If you don’t have a Trader Joe’s near you, I would suggest substituting in one cup of cooked lentils in light olive oil. 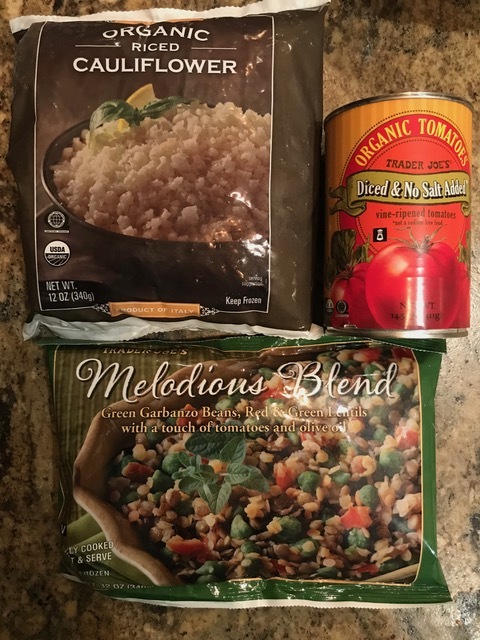 I like the 14.5 oz (411 g) can of organic tomatoes (diced and no salt added) from Trader Joes. I use the whole can which works out to be 1.5 cups of diced tomatoes. I can’t give you an amount because everyone’s tastes and health needs are different. You can make this rice cauliflower fast food dish with or without added salt. If you choose to skip the salt, it will be a little bland. Personally, I like to use garlic salt. I like the added flavor that comes from the garlic. I would suggest adding in a little salt or garlic salt and see how it tastes. If you want a stronger flavor, add more. Preparation is simple. Use the whole bag of organic riced cauliflower (12 oz or 340 g). Add in half the bag of the melodious blend (or 1 cup of cooked lentils in olive oil if you don’t live near a Trader Joe’s). Mix in the entire small can of diced organic tomatoes (1.5 cups, 14.5 oz or 411 g). Then add salt or garlic salt to taste. Given that most of the dish comes frozen, you can heat it on the stove or in the microwave. I often throw the frozen bags and can of tomatoes in my computer bag when I leave in the morning as it is so easy to prepare everything at my hospital. The total preparation time for me, including warming it up, is 5 minutes. I eat the entire dish and it fills me up for half the day. You could easily share this meal with a couple of other people. Assuming you eat the entire dish by yourself, here are the nutritional stats. Cauliflower 80, melodious blend 200, and tomatoes 90 for a grand total of 370 calories. No other 370 calorie meal fills me up as much as this one does. When you see how much food is in this 370 calorie meal you will be amazed. Be prepared to use a huge container for this meal as it probably won’t all fit on your plate. Cauliflower 8 g, melodious blend 11 g, and tomatoes 3 g for a combined total of 22 grams. Considering the average American only eats 15 g of fiber daily, this single dish of 22 grams of fiber crushes what most people can do in a day. This big dose of fiber will fill you up for hours. Cauliflower 8 g, melodious blend 12 g, tomatoes 3 g for a total of 23 g of protein. This is a ton of protein especially considering that it has twice the protein of a McDonald’s hamburger and four-times the protein of an egg. As with all the fiber, this big dose of protein will really keep you full. If you’re not a fan of dairy, it can be hard to get enough calcium in your diet. This riced cauliflower fast food dish will definitely boost your calcium intake. Cauliflower 80 mg, melodious blend 40 mg, and tomatoes 60 mg for a total of 180 mg! As the daily recommended amount of calcium is 1000 mg, you are 20% of the way there with this dish. Cauliflower 280%, melodious blend 6%, tomatoes 105% for a total of 391% of your daily recommended amount of vitamin C! This blows away what you would find in a multivitamin! Cauliflower 20%, melodious blend 15%, tomatoes 20% for a total of 55%! Wow, more than half the optimal amount of potassium you need from this one dish. None. No added sugar. No processed grains. No unhealthy oils. No cholesterol. If you are in a bind for time and want to eat healthily, give this dish a try. All of my kids love this dish. Even my two-year-old son can’t get enough of it. Please feel free to modify this recipe. For example, I have substituted in some healthy marinara sauce in place of the tomatoes and salt. Likewise, I have tried adding in a fifth ingredient, hummus, for a completely different taste. I’d love to hear your thoughts. Also, let me know how you have tweaked the recipe. Thanks for a wonderful newsletter!!! I always look forward to reading the latest and greatest health information. Thank you so much for taking the time. Sorry that you have struggled with tooth problems! I tried the recipe, and I loved it! Thanks for sharing! how do i get your book simplify ? It sounds like the book is no longer downloading when we just changed servers. Let me reach out to my web guy. Gonna try your healthy fast food recipe next time I get out to TJ’s.